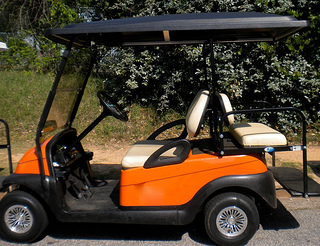 To change your golf cart body, it can be painted, customized and thankfully, repaired. The body of our golf cart has had its share of stress. Between teenagers taking it to school (yes, there actually is a golf cart parking lot at the high school) and riding it all over town on weekends, there have been a few mishaps that have caused some body damage, scratches and dents. 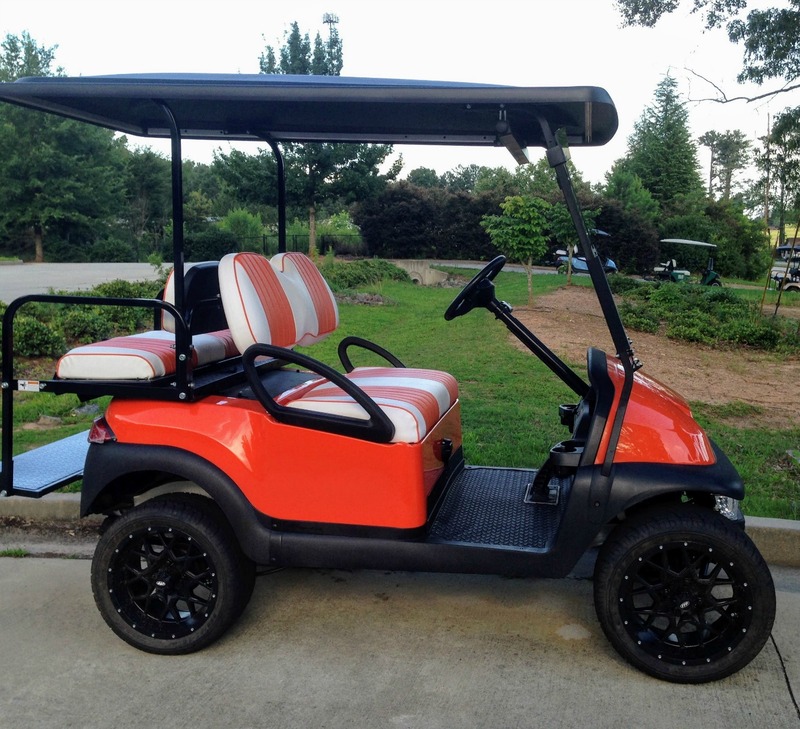 If you want something more than a plain, solid color golf cart body, you might want to consider golf cart skins. Golf cart skins can give your cart a custom look without the cost of a custom paint job - which is alot less than a regular paint job. You can choose to wrap the entire cart in skins (for those who want a camouflage look) but will need a friend to help you. 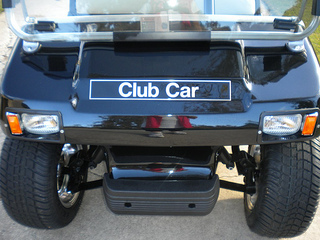 The graphics are applied directly to the surface of your golf cart using a peel & stick application. Turn your regular, plain, boring cart into a Jimmie Johnson race car with the touch a few number 48 decals. Or maybe you have a favorite NFL team that you like to identify with. 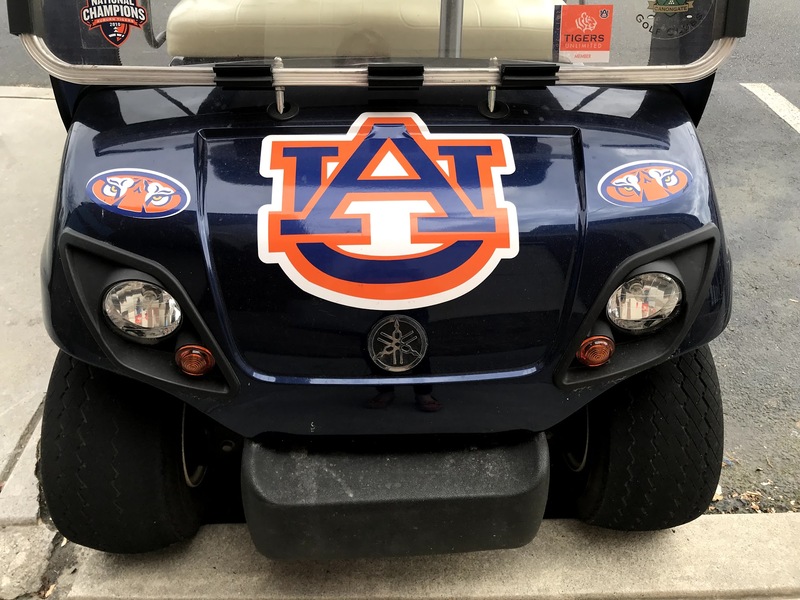 Around here SEC decals sport the front of lots of golf carts. 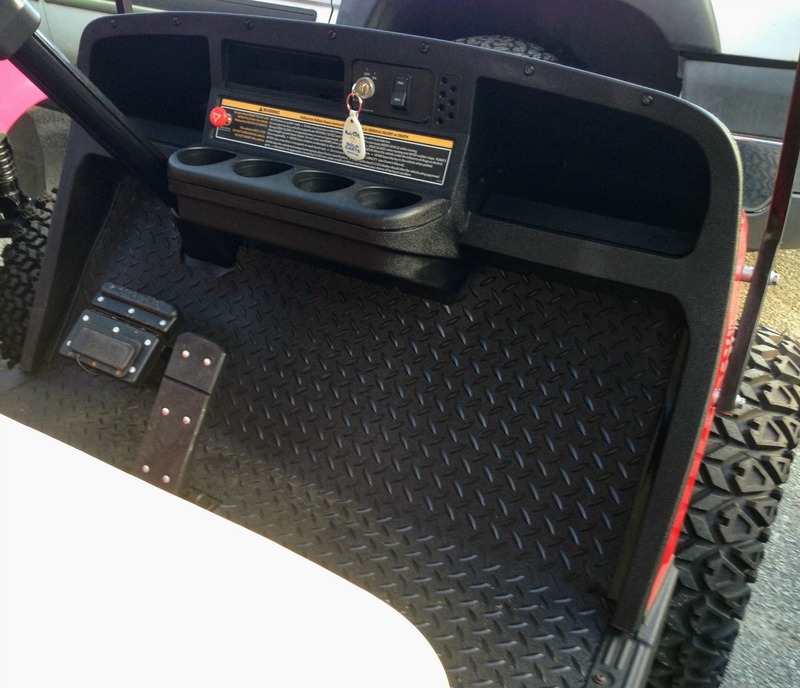 Keep the floor board of your golf cart clean with a floor mat. Golf cart floor mats protect the floor of your golf cart and are useful for all golf carts that are used for golfing, hunting, or industrial or commercial purposes. This rubber mat is heavy duty with a diamond plate design. It doesn't slide around and is easy to clean with a spray from the hose, a sweep of a broom or quick blow from your blower. Brush guards and front sporting clay baskets are just two ways to customize your golf cart. Add fender flares, rocket panels or diamond plate flooring for more style and function. 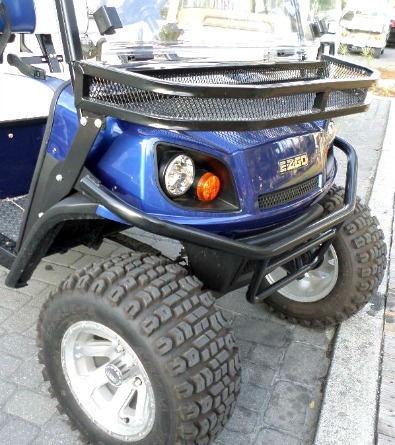 Check out some ideas and pictures to get you going towards accessorizing your custom golf cart. 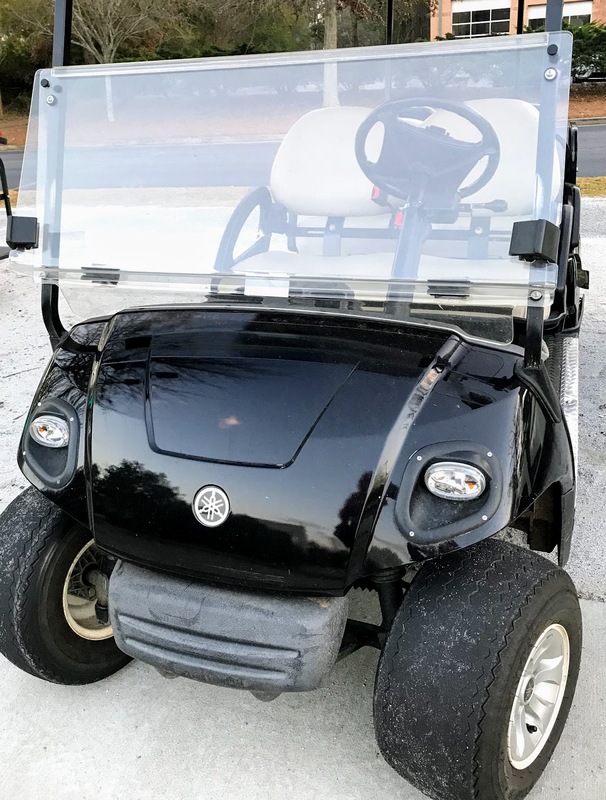 If your front cowl or rear body has some dents and scratches or worse yet, some serious body damage, replace the body with a golf cart body kit. It includes the front cowl and rear body and often the front and rear light sets as well. Select the paint color you want and for a lot less than a new golf cart, you can have yours looking like new. Most people appreciate having a golf cart roof to keep them dry if it rains or shaded from the hot sun. There are universal golf cart tops and customized ones. A top can be added at any time or you can replace a cracked and leaking top with a new one like I did on my 1987 Club Car. A golf cart windshield comes either with a hinge so that it can be folded down or as a one piece unit. The polycarbonate can crack, get scratched, or become foggy - in which case you will need to replace it. 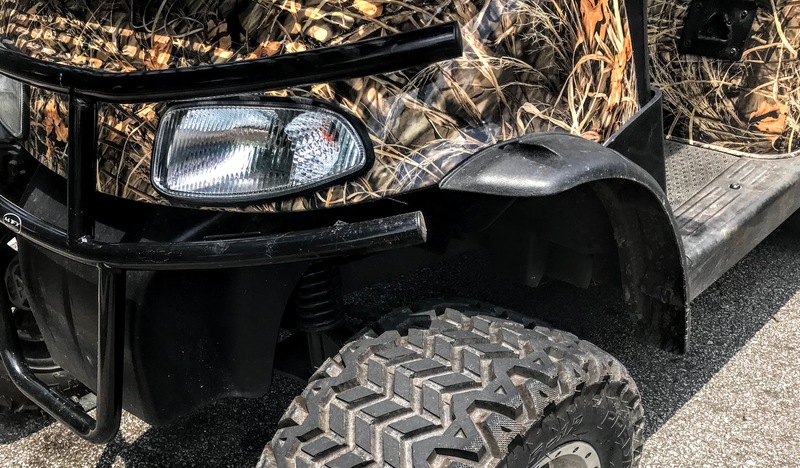 Although not golf cart make or model specific, the replacement windshield you buy depends on the size of the struts that are holding it in place. 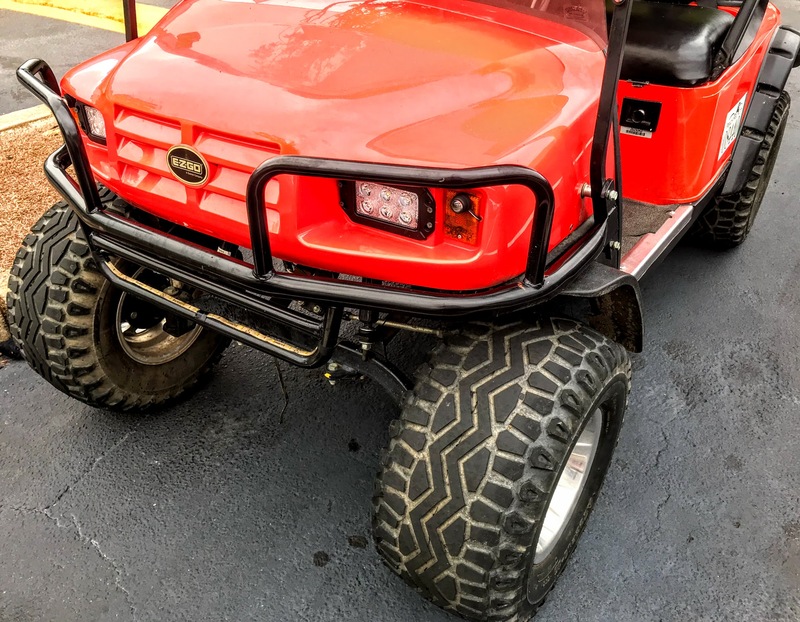 A lifted golf cart is a customization that can be done to most golf carts - it does exactly that .... lifts the golf cart so that there is higher clearance for offroading and going over rugged terrain. 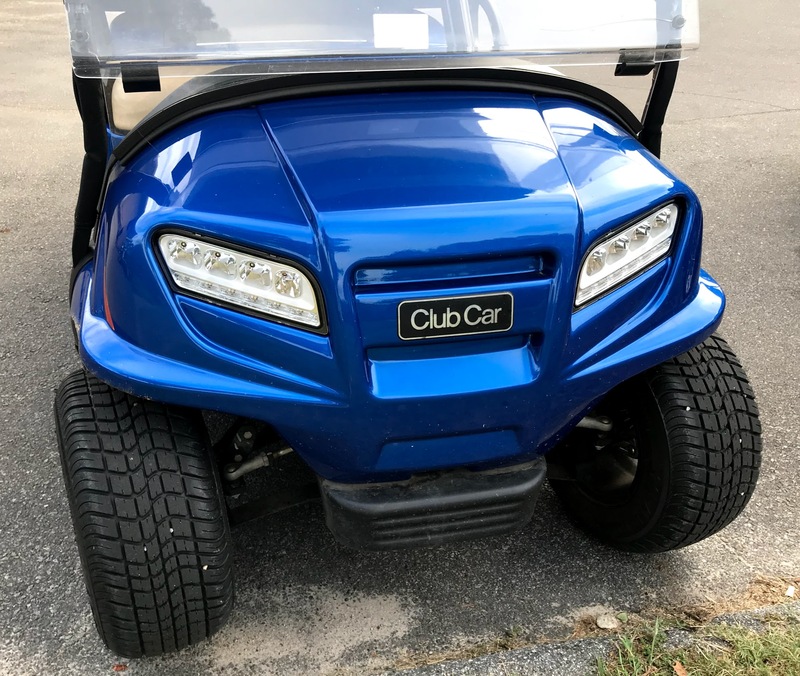 The extra height isn't needed for getting around on smooth, paved golf cart paths, but who says any customization of a golf cart is needed - but it sure looks cool. Golf cart custom bodies come in a wide variety of looks and styles making your golf cart one of a kind. The shape of the body can be anything from a Jaguar to a Mustang. While a custom paint job to the body can incorporate flames to stars and stripes. Scratches on your golf cart can be handled a couple of different ways. Depending on how deep the scratches are, they can sometimes be polished out. Deeper scratches will need a fiber glass plastic filler. 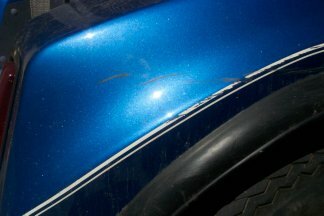 Matching the paint color of your golf cart body just to touch up scratches can be a problem. For $12 you can order a touch up jar of paint on line and give it a try. Would you like to have a new Club Car golf cart body for almost the same price as a new paint job? I sure would. Instead of painting your golf cart, you might want to consider a new body. One of our local Club Car dealers, provides a new Club Car golf car body at almost the same price as painting the old one. The front of my Club Car has some cracks and damage, especially around the headlights so it needs more than new paint. I have owned a 1987 Club Car for 15 years. Had it painted just a few years ago. Now, there is some body damage in the front with some good cracks around the headlights. So I found out that instead of having the body repaired and then painted, I can simply order a new Club Car body - for almost the same price as a new paint job. There are two different Club Car models - The DS which is pictured here or the Club Car Precedent which has a more rounded front cowl. You can select a new DS Club Car body in one of 9 different colors. They are red, burgundy, navy blue, royal blue, silver, black, green, yellow and white. 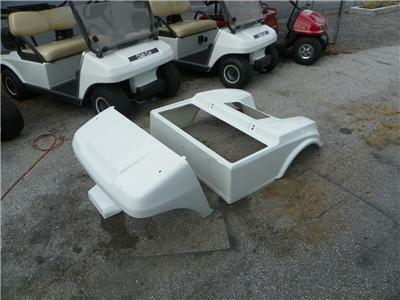 You can also buy golf cart body parts, such as the front cowl -painted white or beige, or primed and ready to be painted. The body of your golf cart will eventually get some scuff marks that plain old water and soap will not be able to remove. They might be black scuff marks on the fiberglass or from tree or brush scrapes. Cleaning scuff marks off of golf cart bodies is easy when you find the right fiberglass cleaner - and I just did. The directions stated to "spray directly onto the mark from a distance of at least 8 inches." Which I did. Then you need to allow the spray gel to work for several seconds. I probably waited 30 seconds or so. Always use a soft cloth on fiberglass bodies. I save all of my old white cotton t-shirts for cleaning my golf cart. After gently wiping off the area that was sprayed, the fiberglass looks as good as new. It did help to restore some shine to my 1987 Club car. It also says that the spray provides protection from UV damage - such as fading and the wax finish helps to prevent scuff marks.